Established in 1926, Cooking Lake Airport is Canada's oldest operating airport. Originally established as a seaplane base to support aircraft opening up the north, Cooking Lake Airport was instrumental in providing a gateway between Edmonton and the remote northern communities. Many famous bush pilots flew from Cooking Lake including Punch Dickens, Leigh Brintnell, Wop May, Will Rogers, Roy Brown, and Max Ward. In fact, Max Ward took delivery of his first otter aircraft at Cooking Lake in 1953 and later went on to found Wardair. Cooking Lake Airport was also the aircraft staging route for construction of the Alaska Highway during World War Two. Today, Cooking Lake Airport is the sixth busiest community airport in Alberta and continues to serve as the starting point for some of the greatest aviation adventures in many pilot's flying careers. 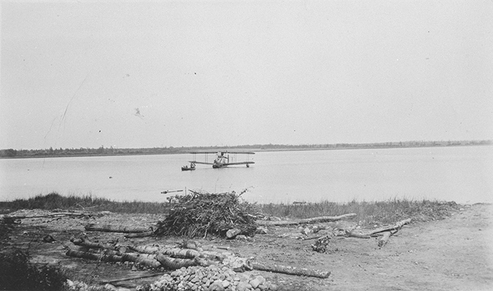 In 1922, an amphibian Vickers Viking Mark IV (Type 69) landed in the water just off Plover Point at Cooking Lake. The aircraft was operated by Laurentide Air Service of Montreal. There was no "official" airport at Cooking Lake at that time but it signified the start of great things to come. With very few regulations and even fewer aircraft facilities, early bush pilots quickly learned to improvise wherever they flew. So it was no surprise that they didn’t ask for permission to start an airport at Cooking Lake, they just set up their docks, cranes and fuel shacks and built what they needed. Word traveled quickly among the small, tight-knit flying community and by 1926 Cooking Lake had become a favorite location and was buzzing with seaplane activity. In those early days, there was no real owner or operator of the airport but as far as the pilots were concerned it was the real deal. ​Legendary World War I pilot and bush pilot, Wop May, began using the Cooking Lake seaplane base in 1929 when his company, Commercial Airways, won the contract to fly the Royal mail into the far north all the way down the Mackenzie River to Aklavik. The aircraft he used was a brand new Bellanca Pacemaker CH 300, and by the summer of 1930 he had 5 Bellancas and a Lockheed Vega flying out of Cooking Lake Airport. Wop May's initial fame came from an encounter with the Red Baron in 1918. Wop was in a desperate fight for his life, being pursued by the Red Baron in a dog fight. Roy Brown came to Wop's rescue and shot down the Red Baron. In 1928, Wop May and Vic Horner made a daring flight to deliver life-saving medicine to Fort Vermilion during a diptheria outbreak. The mercy flight took off on a bitterly cold December morning in an open cockpit Avro Avian - the Avro did not have a heater. Wop and Vic were credited with saving the lives of many in the remote northern community. One of the earliest recorded medevac flights in Alberta occurred on August 28, 1932. Walter and Gladys Hill of Fort McMurray were advised by their doctor to travel to Edmonton for more advanced medical assistance due to potential complications with Gladys' pregnancy. A float equipped Fokker Universal C-FAHJ owned by Explorers Air Transport Ltd. flew the couple to Cooking Lake where a healthy baby boy was born 10 minutes after landing. Fortunately there were no complications and the young family was later transported to Edmonton by ambulance for medical care, just to be safe. 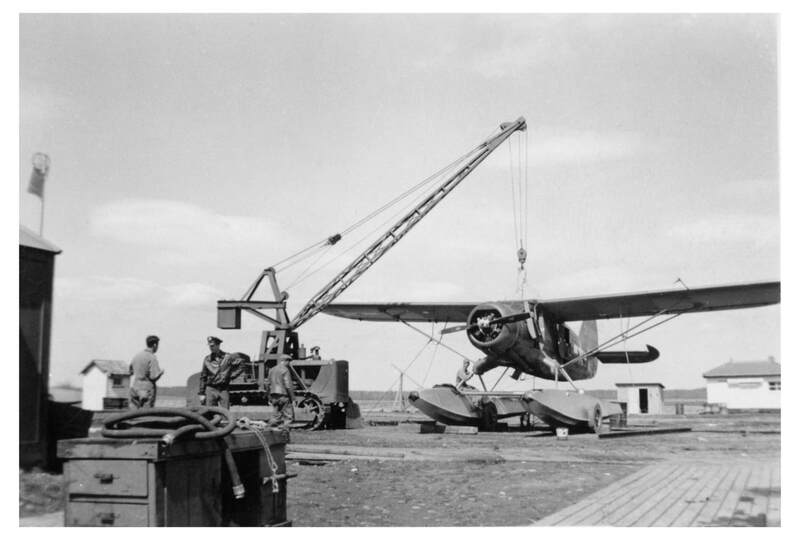 In 1933 the City of Edmonton allocated $5,000 and began construction of an administration building, movable dock, slipway and a 5 ton crane for hoisting planes in and out of the water for maintenance and float changeovers. A 2,500 foot by 150 foot grass landing strip was also constructed to allow wheeled aircraft to use the airport. The work was done manually by hundreds of men and teams of horses using Fresnos and graders to level the land. The work continued for 3 years and was completed in 1936 with the opening of an administration building featuring a large lounge, stone fireplace, and seven guest rooms. Mr. Neville "Robby" Robertson was hired by the City of Edmonton to be the first official caretaker of the Cooking Lake Airport. Cooking Lake Airport Lodge 1938. Photo courtesy of Alberta Provincial Museum and Archives. The U.S. Army Air Force established a base at Cooking Lake Airport in 1942 to support the construction of the Alaska Highway, and the Canol pipeline connecting Norman Wells to Whitehorse in the Yukon. These projects were a high priority because the Japanese were invading the Aleutians and threatening North America. The Americans wisely purchased a number of Canadian built Norduyn Norseman aircraft (dubbed the C-64) and hired experienced Canadian pilots to teach their servicemen how to fly and survive in Canada's north. The American's also needed a highly experienced maintenance engineer so in 1942 they hired Orville (Art) Spooner as their crew chief at the Cooking Lake Base. Art Spooner gained many of his aircraft skills from working at Wop May's Canadian Airways doing aircraft maintenance and salvage work along the Northwest staging route. Docks were upgraded and a new seawall was built but by 1943 the Alaska Highway was largely completed and the war was starting to turn in the allies favor. The Canol pipeline was abandoned without a single drop of oil being pumped and by 1945 the American presence at the Cooking Lake Airport had wound down and the airport reverted back to its previous commercial aviation operations. In 1946 the City of Edmonton began losing interest in operating the Cooking Lake Airport so on January 14, 1947 Mayor Harry Ainley announced the airport would be closed. There was no consultation with any of the airport users so the controversial decision was fiercely opposed by the many commercial air service operators who relied on the airport for their business. It was a public relations and business nightmare. To appease the public and the commercial air service operators, the City of Edmonton reversed the decision to close the airport and then offered to lease the airport to Robby Robertson and allow him to make a living off whatever proceeds he could generate from the airport. Mr. Robertson declined so the same offer was extended to Art Spooner who accepted it in April 1947. Art moved his family into the lodge and continued to extend the tradition of hospitality to pilots and air crews using the airport. In 1947, the Leduc #1 oil discovery brought a new wave of activity to the airport. Oil companies found that float equipped aircraft were ideal for exploring Alberta's north and moving crews and equipment into remote locations. The City of Edmonton had second thoughts about the closure of the airport and in May, 1951 obtained a federal government grant of $20,000 to rehabilitate the docks and buildings. In the summer of 1956, concerns about receding water levels and the potential cost of pumping water from the North Saskatchewan River into Cooking Lake to maintain water levels resulted in the City of Edmonton again looking for ways to sell off its interest in the airport. The City placed a value of $16,400 on the airport assets and opened it up for bidding. Art Spooner made a bid of $12,000 but the provincial and federal government intervened and the offer was rejected - the Province still owned the land and refused to sell it to an individual, and both the provincial and the federal government pressured the City of Edmonton to continue operation of the airport as an auxiliary feature of the Edmonton Municipal Airport. ​In 1959 the Cooking Lake Airport was featured in the Hollywood movie "Wings of Chance" starring Frances Rafferty and James Brown. This was one of the first Hollywood movies to be filmed entirely in Canada. The film crew stayed at the Cooking Lake Airport lodge during the filming and became part of Art Spooner's extended family. The movie was based on the book "Kirby's Gander" written by Alberta author John Patrick Gelese. ​Jacques Cousteau also came to the airport to film one of his earliest documentaries, in that film Art Spooner played the part of an Indian guide. By 1969, the lodge and the docks at the airport had fallen into disrepair and were condemned by the City of Edmonton. Rather than investing any money in repairing the structures, the City again looked for ways to sell off its interests in the airport. In November 1970, Alberta Transportation took over operation of the airport and became the sole owner and operator of the facility. During the initial years of ownership by Alberta Transportation Art Spooner continued to manage the airport as he had since 1947, but by 1976 the government was under pressure to formalize the financial and contractual arrangements for operating the airport. The contractual negotiations with Mr. Spooner continued for several years until 1979 when Mr. Spooner decided to finally retire from the airport. In early 1980, a plan was drawn up to reconstruct the Cooking Lake Airport to become the crown jewel in Alberta Transportation's province wide system of community airports. On February 4, 1981 the historic Cooking Lake Airport Lodge which had served an entire generation of pilots and hosted numerous government officials and celebrities was torn down. A new seaplane loading ramp was constructed, the grass runway was repaired and new runway edge markers were installed. ​A temporary terminal building, consisting of a used construction job shack trailer, was installed. The "temporary" terminal building is still being used today. The following year, a tie-down cable anchor system was installed for 65 aircraft, outdoor toilets were built, and electric power was installed throughout the airport. A fuel truck was also purchased to provide aircraft refueling at the docks and around the field. Mr. Paul Mudryk was hired on November 1, 1982 as the first full-time airport manager since Art Spooner retired in 1979. His first aircraft report showed 172 aircraft movements for November 1981. In September, 1984 the grass runway was closed to allow for asphalt paving. Aircraft were temporarily relocated to the Edmonton City Center Airport and Twin Island while the work was carried out. Unfortunately, an unusually early and severe winter snowstorm in October resulted in the paving work being suspended until the following spring. The paving was completed in June 1985 along with the electric runway/taxiway edge lighting and a rotating airport beacon. The airport maintenance shop was also completed in the summer of 1985. A second construction job shack was added to the temporary terminal building which included an airport manager's office. Cooking Lake Airport had the largest number of aircraft based on the field of any of Alberta Transportation's community airports so in the summer of 1987 six additional taxiways were upgraded from gravel to asphalt. To assist in drainage of the taxiways, weeping tile was installed below the edges of the taxiways to help draw water away. To keep up with the growth at the airport, Paul Mudryk hired Tom Steel in January, 1988. Mudryk retired in November of that same year so Tom Steel became the fourth full-time airport manager at Cooking Lake. Alberta Transportation surveyed the airport to create hangar lots for lease to private and commercial operators. By the end of 1985, the first hangar leases were signed and hangars erected by Adrian Met, Liard Development Ltd., Cooking Lake Air Service, Charles Jennison, and Cameron Bay Air Services. Over the following few years, many more lots were leased and hangars were constructed. The Cooking Lake Airport Tenants Association was formed to coordinate the needs of airports users with Alberta Transportation. In 1995, the Regional Airport Authority Act brought the Cooking Lake Airport, City, Villeneuve Airport and the International Airport together under the ownership and management of the Edmonton Regional Airport Authority (ERAA). The Edmonton City Center Airport remained under the ownership of the City of Edmonton but was operated, under contract, by ERAA. The transfer agreement between Alberta Transportation and ERAA required ERAA to operate Cooking Lake Airport for a minimum of 10 years. Alberta Transportation also provided transitional funding to ERAA to help fund airport maintenance and upgrades during the initial transition years. ERAA hired Tom Steel to continue his long-standing role as the Cooking Lake Airport Operations Manager. Tom was thoroughly familiar with all facets of operating the airport and had developed a reputation for superb maintenance of the airport facilities. Even when other nearby airports were closed due to snow and ice accumulations, the Cooking Lake Airport runway was always cleared within just a few hours of the snowfall. Tom and his wife Susan live on the airport in their home adjacent to the airport maintenance building. In 1997, ERAA subdivided the hangar properties to create the first bare land airport condominium in Canada. This was a significant departure from the traditional rental model for hangar properties at other airports. The condominium ownership model provides many benefits to hangar owners including improved access to financing, greater financial security, and more control over private and common property. The Cooking Lake Airport Tenant's Association naturally evolved into the Cooking Lake Airport Condominium Association (legally known as The Owners: Condominium Plan 9721458). By 2008, ERAA had determined that the Cooking Lake Airport was no longer core to its airport strategy. ERAA General Aviation Manager, Andy Shanks, advised the County of Strathcona and the Condominium Board in March 2008 that ERAA would devolve it's interest in the Cooking Lake Airport. If neither the County or the Condominium would step up to take over the airport, ERA would consider selling the airport to a third party or permanently closing the airport. Just like 1947, the Cooking Lake Airport was again facing the grim possibility of closure. The Condominium Board formed a committee to investigate various operating models and began lobbying the County to take over the airport. As the largest hub of economic activity in the southwest quadrant of the County it seemed logical that the County would jump at the opportunity to take over operation of the airport for the benefit of the community but they remained uninterested and chose to focus their support on the much smaller airport at Josephberg. Negotiations continued for 4 years and on October 1, 2012, ERAA transferred ownership and operation of the airport to the Condominium Association. Since that time, the Condominium Association has been operating the airport for the benefit of the public with no government support of any kind. Between 2008 and 2014 the County of Strathcona increased basic property taxes on the airport by approximately 25 per cent each year. The County also found additional ways to further extract taxes from the airport and in 2014 the County collected 470 per cent more tax from the airport than they did in 2008. Property taxes on a simple hangar at the Cooking Lake Airport are double the taxes of similar taxes at the nearby County-owned Josephberg Airport. The Alberta Composite Assessment Review Board confirmed the massive tax inequity in a 2015 appeal but ruled the County had the legal right to assess the excessive taxes - legal doesn't always mean fair. Cooking Lake Airport is serving 87 per cent of the public aeronautical transportation requirements of the entire county compared to only 13 per cent at the County-owned Warren Thomas Airport. Strathcona County provides no municipal services such as snow removal, road repair, garbage collection, water, sewer, etc., to the airport while collecting more than $250,000 each year in property taxes. ​Today, the Cooking Lake Airport is the oldest operating public airport in Canada, sixth busiest community airport in Alberta, the province's newest international airport, and home-base to almost 200 aircraft. As it was in the very beginning, the airport is operated and funded entirely by volunteers for the benefit of the entire community.